Much planning, much work, much preparation, much prayer and it all came together. Camp Hope 2013, the first Camp Hope is now history, leaving big smiles on faces and in hearts, along with a sense of awe at what God has done. Who? Forty-one kids, and about thirty volunteer camp staff. What? A summer camp for underprivileged, at risk kids. Those are the facts, but what happened there is hard to describe. I should be able to describe it. I was there 3 of the 4 days before honoring another previously scheduled commitment. 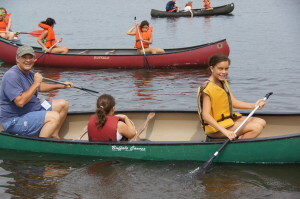 My main assigned job was camp photographer, so I roamed everywhere taking photos, and observing all the action as different cabins or groups of boys and girls went from activity to activity, enjoying, learning, interacting with each other and the staff. I also baited some hooks, toted some stuff to and around camp, helped with canoeing activities, told some Bible stories, and picked up small amounts of liter here and there. 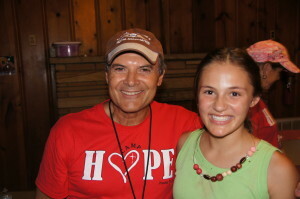 I ate with the campers, slept in a cabin, and worshiped with them at various times. I gave and received many smiles and hugs throughout each action filled but strangely peaceful day, as did the other staff and leaders. I feel like my contribution and part was small compared to the main leaders and volunteers, but important. I’m starting to see that everyone’s gift is important, as is every act of service or act of kindness, especially if it’s freely given from the heart. But the fact is I find it hard, if not impossible, to describe what happened here. And that’s what I’m trying to do! I don’t know how to wrap my mind or arms around it? I think the other volunteers would say the same thing? A grin comes to my lips and my heart when I think about it, but not words? There was plenty of hard work, planning, and action by the three main leaders, Steve, Wendy, and Sue, along with a gifted and giving group of helpers–worship leaders, cooks, counselors, medics, art and music teachers, activity leaders, etc. ; but we all have a sense of awe about the whole experience and how it turned out. It’s a sense that the whole is greater than the sum of it’s parts. We all know, I suppose, that the awe factor was the presence of God at the camp. He’s very good, very big, and moving in all areas of our human experience. When He comes it’s beautiful, peaceful, loving, and joyful to experience, but hard to describe. Thank you Father, for loving these kids, and adults, and for your Presence at Camp Hope 2013. Amen. אמן A faithful Father and a faithful King you are. In ways seen and unseen, You changed us for good. Camp Hope 2013 from Dwayne Bell on Vimeo. 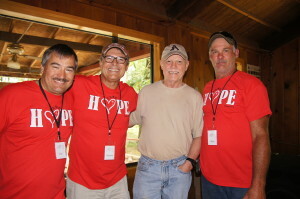 Thank you SO much for taking time to write this blog about Camp Hope and to include the pictures. 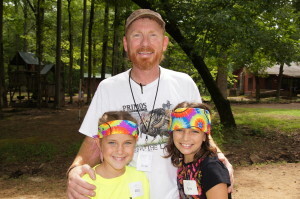 Awesome memories…amazing kids that are so close to God’s are, and getting to be close to so many of us as well. Dwayne, thanks so much for your contribution to the camp, for your faithful prayers for these children, the amazing photos, your friendship, and service to the king! God’s presence was very strong and I can see true change in several of the children.